You may have heard of some of the trials my kingdom has undergone as of late, and hopefully you've heard of the good and gentle folk that have stood up in the face of really, really bad things. One of those standing first was Duke Cuan Macdaige. I had complimented Duke Cuan on the good work he had done in the stand our populace has taken against predators and people who wounded and divided our Kingdom. He told me that if I wanted to thank him, I'd write a song--but not about him. He wanted a song about how Atlantia is bigger than any one bad person. 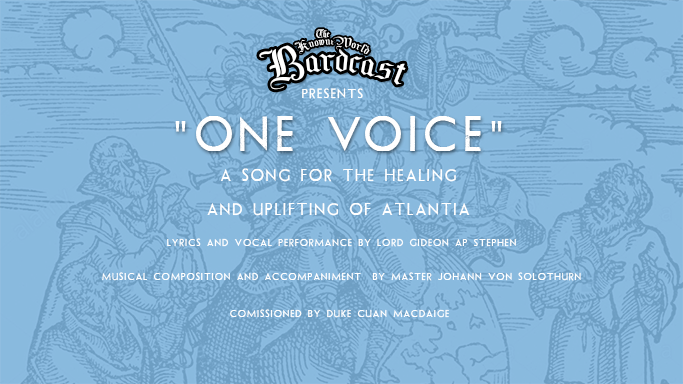 A song defining Atlantia as a people in service to a dream, not to any man. I collaborated with my brother bard Master Johann, and this is that song. Season 2: Episode 6: BARDIC SOUP!